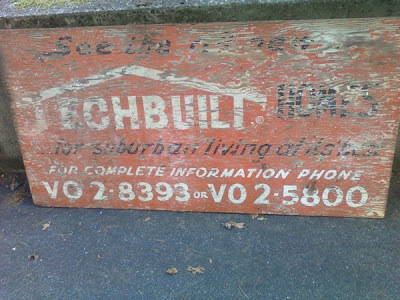 Interesting article in the local Patch for Lexington (quoting John Tse) about a recent discovery of an old sign for sales of Carl Koch's Techbuilt houses in Middle Ridge/Turning Mill, as described in a recent post of mine. Nice sign. But what does it mean?